Woodchester Mansion which is surrounded by two miles of woodland, , is an eerie sight to behold looking like your typical haunted house. There have been many apparitions sighted here along with rife poltergeist activity in the dark cellar and voices which have been recorded on EVP telling visitors to" GET OUT "in certain room's of the Mansion. 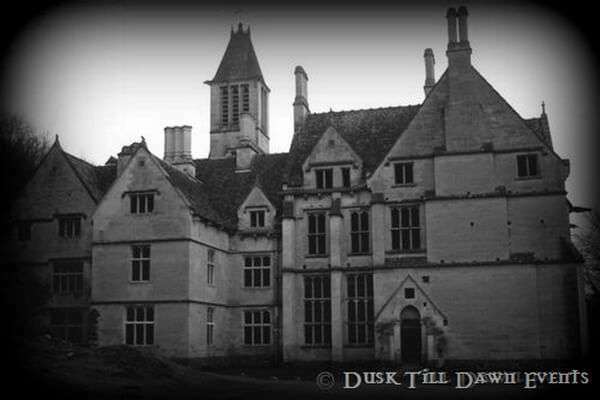 Dusk Till Dawn Events have this unique building for an entire nights investigation and you have the chance to join in your very own Ghost Hunt at one of the UK'S Most Haunted Locations. You will have full use of Ghost Hunting Equipment and the night will be hosted by experienced team of Paranormal Investigators. You will take part in various experiments such as Table Tipping and Glass Divination Vigils throughout the night in the most active parts of the Mansion. This really is Ghost hunting at its best with such a fantastic haunted location but remember there is no heating at Woodchester Mansion just one open fire in one room only. It will be very cold also very dark so wrap up warm and bring Torches. As this Building gets very cold Dusk Till Dawn Events advise Guests to wear warm clothing. If you choose the non-refundable deposit option, the final payment for this event will be required no later than the 19th September 2019. PLEASE NOTE: To avoid getting lost we strongly advise you to use the map that we will send you by email as sat navigation does not work for this location. Please arrive to event on time as the Mansion is situated in such a remote area. Phone signals are poor and you may not be able to reach us by phone after this time. *If paying by Deposit please note the final payment for this event will be required no later than the TBA. We regret this event is not suitable for people with mobility issues.